Today is "Take your Kid to Work" day--so R is taking A to work despite the fact that school was cancelled. And it's not snowing. It was cancelled without any info albeit there were a few bomb threats at the school yesterday with an M-80 (large firecracker) found in a Middle School bathroom with a note taking responsibilty for the prank and threatening more. I surmise that maybe some preventative work is in place to deal with this prior to it happening again. Took K for a walk early in the morning. 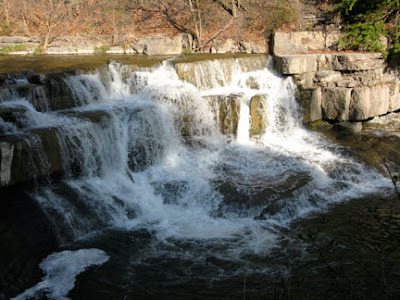 We went to Taughannock Falls park with the poochita to see the buds and early leaves, see the falls and the high water. It was wonderful being in the cool, humid breeze with K. chattering on about her favorite video set "Planet Earth" and all the wonderful details that have lodged in her brain dying to come out. She is such a peach--and we had an amusing time talking about science, nature, biology while Shady Grove sniffed and sniffed and sniffed. The pictures are from that stroll in the morning air.